The walls of the house were wet with paint, the carpets were nonexistent, and the cabinets were yet to be installed. Students frantically rushed around, patching up a wall here, installing a tile there. It all resembled the set of the ABC show Extreme Home Makeover. STUDENTS IN CHARGE : Dena Malloy, a graduate student at Cal Poly, was part of a group of 13 students who remodeled the house of Nipomo residents Ken and Mary Barrette in only six days. That’s fine with Cal Poly professor Roya Javadpour, who said that she welcomes the comparison. Javadpour is the advisor for a project called PolyHouse. 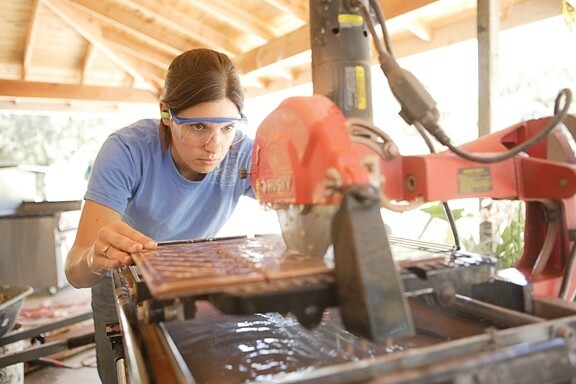 It’s a 10-week course at Cal Poly that gives students the chance to plan, organize, and then renovate an entire house with six weeks of planning and just six days of actual construction. This is the fifth year that PolyHouse has taken on a remodel, each time with different students and a different house. They’ve pulled it off every time, Javadpour said. Javadpour said that at least 60 percent of the work is done by her students, a mix of graduate students studying business, engineering management, and industrial and manufacturing engineering. This year’s crop of 13 students faced an interesting challenge. They set out to remodel the house of Nipomo residents Ken and Mary Barrette. Ken has been confined to a wheelchair since 1992. Shortly after Ken became sick, Mary and he learned that the house they had bought five years earlier had some serious structural problems. Mary made the repairs herself at first, with instructions from Ken, a former contractor. But there was only so much she could do. And while the Barrettes were able to make changes to the house to accommodate Ken’s wheelchair, they couldn’t afford to clean up afterward. WORKING HARD : With only one day to go before the big reveal, the students in Roya Javadpour’s class still had a lot of work to do. The ceiling was ripped out to install a lift for Ken and then left bare. The carpet was pulled up, and the cement floors lay exposed. To make matters worse, Ken had to watch it all happen without being able to do anything about it. As someone who used to fix everything around the house, he found that difficult. Local nonprofit Central Coast Caregivers recommended the Barrettes to PolyHouse. They were chosen because of their unique situation and the different learning opportunities their house would provide for the students, Javadpour said. The three-bedroom, two-story house in Nipomo had been converted downstairs to hold an extra bedroom and bathroom for Ken. The PolyHouse team renovated his bedroom and bath, installed low grout tiles for a wheelchair-friendly environment, and completely remodeled the kitchen. They also reinforced a wall that had been held up by 4-by-4 planks and painted the entire house. Upstairs, the couple’s two daughters—Selyn, 20, and Krista, 17—were pleased to see that their rooms had been re-carpeted, painted, and redecorated. Their mom was equally happy to have a tile floor in her sewing room for easier pin clean-up. “It just looked like a brand-new house, like I was walking into someone else’s house,” Mary said. “I honestly didn’t know what I wanted, but they painted my room and I love it,” Krista added. After the big reveal, Mary said that Ken and she had stayed up until 3:30 a.m. They were too excited to sleep. The PolyHouse class raised $50,000 to re-do the house, including donated items and work done for free or at cost by local contractors. The amount of work that they put into the house was staggering, even to them. “To be able to come in and re-do their entire house in a week, this surpasses anything I thought we could do,” said student Herndon. Javadpour said that every student who has come through PolyHouse has told her that they’d do it again in an instant if they got the chance. In fact, some of her former students came out to the Barrettes’ house this time around, just to see if they could lend a hand. Their effort was appreciated by the Barrettes, who were still unpacking and settling into their newly remodeled house the night after the students left. “It’s still like a dream to me,” Ken said. Sarah E. Thien is a writer for New Times’ sister paper, the Sun, in Santa Maria. Contact her at sthien@santamariasun.com.